Some folks, as they near 40, occasionally pause to marvel at the years that slipped past in an instant. "I still feel 20," they stutter. I had a similarly unsettling realization when I signed up for the Golden Gate 50K. "Has it really been eight years?" I still think of myself as a novice runner, yet my first 50K (on a similar course as my upcoming race in two weeks, yay nostalgia) was in December 2010. I don't even like to admit the number of foot races that I've thrown down since then. 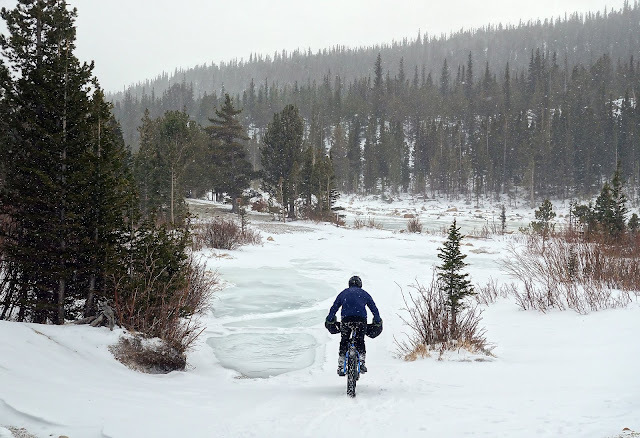 I started riding a fat bike in 2007, and my "snow biking" predates that by two years. Fourteen years is more than enough time to age into the masters' division of any sport, especially after I put that thousand-mile ride across Alaska on my resume ... yet I can't give up the notion of being a new kid, still learning the ropes. Maybe being a perpetual beginner is just another way we cling to youth. Or, perhaps, I am just so abjectly terrible at my sports that this delusion is the only way my ego can bear the indignity of continuing participation. 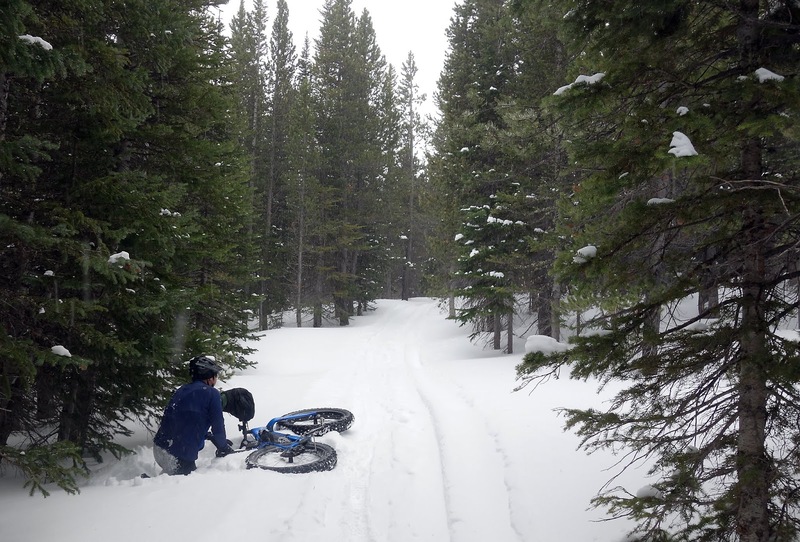 Here in Colorado, fat biking is distinctly different from most of my previous experiences. Alaska has an extensive culture of motorized winter trail use and more consistent cold, resulting in comparatively wide and compact surfaces on which to ride a bike. 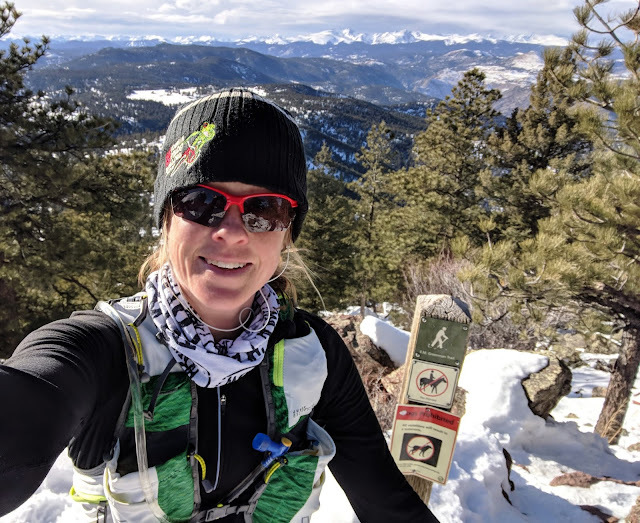 In Colorado, you mainly have user trails — foot- or ski-packed, on mountainous terrain that is constantly slammed by blizzards, long thaws and wind. Thus, trails are in a continuous — and I mean continuous — state of flux. I recently started following a Facebook group of enthusiastic cyclists who call themselves the "Front Range Fatties." 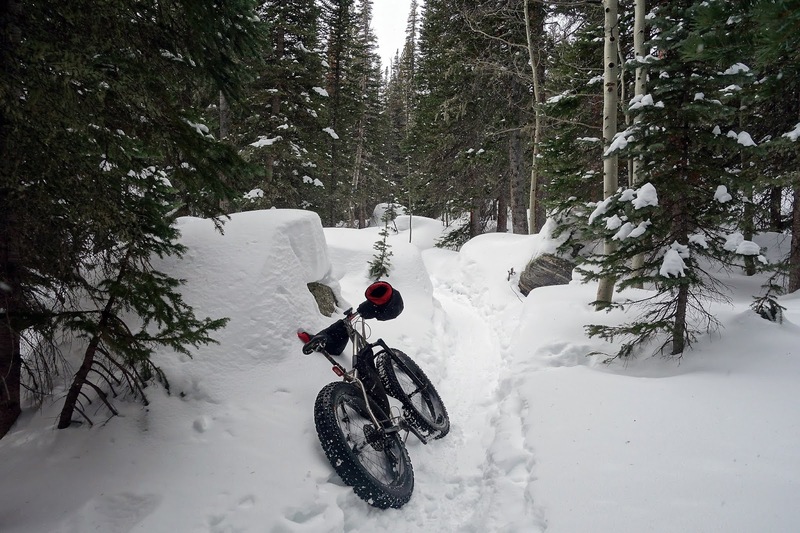 Often members of this group post about going out to stomp two miles of trail with their snowshoes, just so they can go back and ride their own trail with tires aired down to 0.5 psi. Then, when said trail is blown in the next day, they go out and do it again. I glean much amusement from the Front Range Fatties, who must love bikes so much — I mean, I am a devoted member in the Church of Slog, and these folks undoubtedly outrank me. 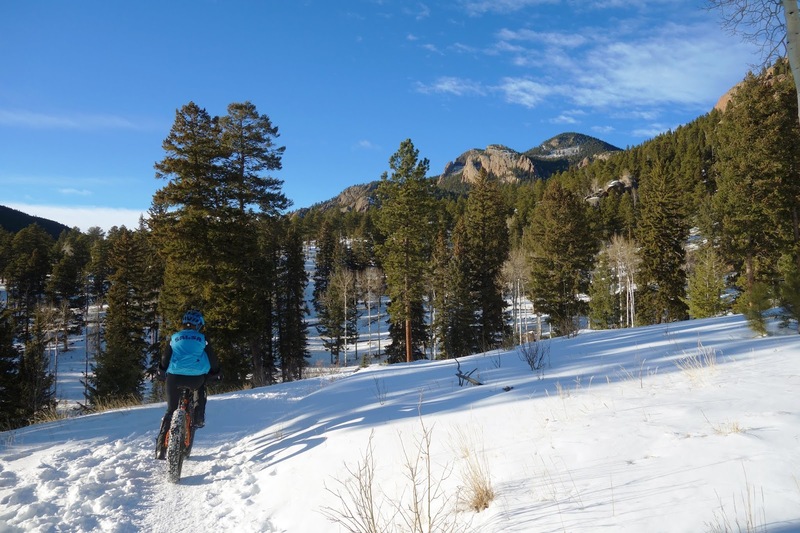 When it comes to riding fat bikes in the Front Range, I believe I can unironically call myself a beginner. I've been slow to get on the bandwagon and still skeptical that this is a good sport for me here, but I've been lucky to meet a few friends who help coax me out of my comfort zone. Last Wednesday, Dennis (undeserving victim of government shutdown nonsense) was being called back to work without pay, and wanted to spend one more morning in his happy place, Peaceful Valley. I unintentionally forgot to bring my helmet, which induced anxiety — I crash *a lot* on snowy singletrack, and there are trees everywhere. But I tried to shake it off since I want Dennis to think that I'm cool and not the perpetually awkward and unskilled cyclist that I really am. 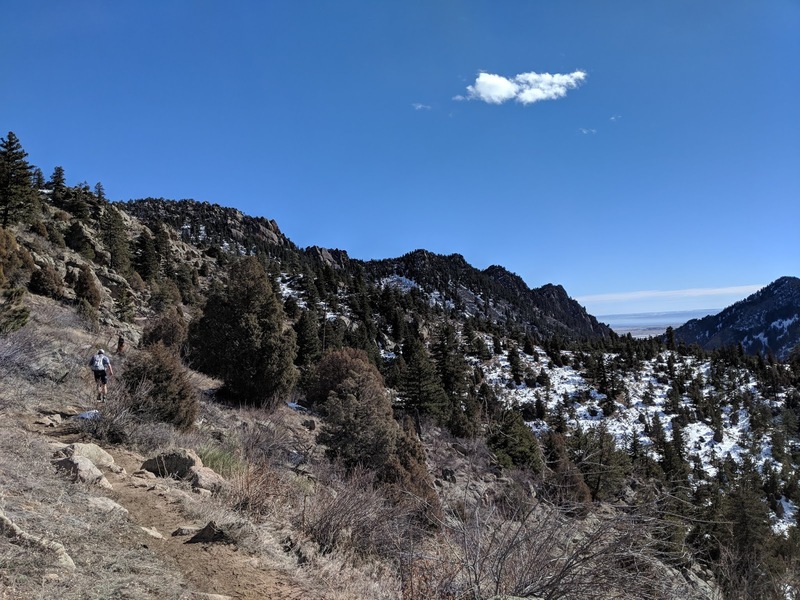 We started grinding up a lovely ribbon of singletrack that was smooth and flowing for about three miles, until recent foot traffic faded to nothing. Then the trail narrowed further into what was likely just ski trench — sometimes up to three feet deep with limited traction and no room to bail. You can not push a bike in a trail this narrow, so I pedaled as though stopping was not an option. My heart rate spiked into the 170s, nearly maxed out, and the rear tire slipped and spun even though I'd aired down to 2 psi. My tires were so flat that the bike bounced and steered itself on remotely packed surfaces. But it wasn't low enough for these conditions. The trail wound through the forest, climbing steeply beside a creek bed. I felt as though I was sprinting in place, with both legs brushing against a wall of snow that was waiting to swallow me. Eventually the redlined effort got the better of me, my focus flickered, and I veered off trail. It was a rather spectacular fall, given that I was probably only going about 2 mph when I toppled over. Luckily I didn't hit a tree, but I was 80 percent buried in the snow, and somehow managed to rip the backside out of another pair of expensive wind-resistant tights (luckily Beat was able to repair both, and I had my trusty primaloft shorts on hand to hide my shame.) After that I couldn't get going on the steep incline and had to resort to pushing my bike from behind. 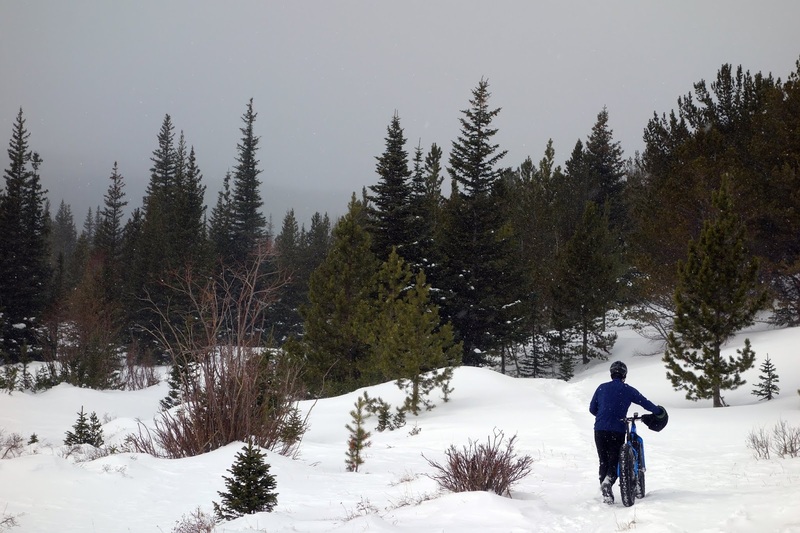 Snow was spitting sideways when we crested a high point near the wilderness boundary, five miles and two exhausting hours into the ride. The trail beyond here was windblown and mostly invisible, so we pushed through knee-deep fluff for a mile and a half. This admittedly the part of the ride I enjoyed the most, or at least where I felt the least taxed. I appreciated a stress-free half hour to trudge along and chat with Dennis. Then it was time for the most stressful part of all — the squirrelly, fishtailing, helmet-free descent. I exercised an abundance of caution. Too much, really, but I did minimize crashes. The final part of the trail was heavily rutted by a bike with far too much tire pressure, and traversed a steep side slope where tipping over could be highly consequential. I mostly boot-skied to stay in the rut. My blood was boiling with cortisol and adrenaline when we arrived back at the parking lot, 13 miles and four hours later. "Holy hell that was a tough 13 miles," I exclaimed to Dennis. He was grinning. I admittedly felt a warm sense of satisfaction myself, because holy hell, that was a challenge. On Thursday Beat wanted to swap our vehicle so he could run home from work. Normally I ride into town for this task, but my strong desire to not sputter out in my 100-mile races this spring means I really do need to worry about my conditioning. So I planned a 17-mile foot route that was highly runnable, with only one relaxing if strenuous hiking diversion to ascend the steep side of Green Mountain. 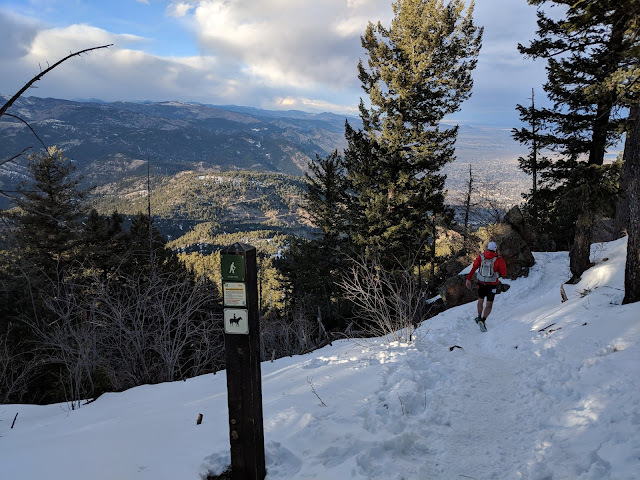 Trail conditions made for a less straightforward running effort — there was a lot of slush and mud, and a long descent on Chapman trail was a slippery, postholing affair. The final seven miles were relatively flat on the bumpy ice and pavement of the Boulder bike path. Just seven miles, but by the end, I was ready to intentionally roll my ankle just to make it stop. Since I love monotony and slog, I'm not exactly sure why I hate running pavement so much, but I really do. It's not even that I was pushing hard or in pain; I was just mentally done. Back when I was newer trail runner and full of smugness, I used to joke that one of my goals was to make it through life without running a road marathon. Now, I'm beginning to think that a road marathon might just be my ultimate challenge. Even if I allow myself to run at these relatively painless 10- or 11-minute miles, my resolve is likely to implode in spectacular fashion before the end. I should probably run one, for that reason alone. 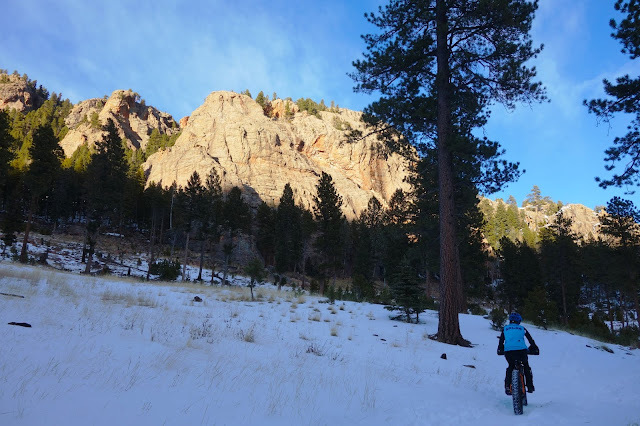 On Saturday, Betsy and I headed to Staunton State Park with our fat bikes. I tend to discount the open spaces west of Denver as being overcrowded and not really worth the drive, but Staunton was wonderful in every way. This park is refreshingly bike-friendly and uncrowded, at least on a beautiful Saturday afternoon in January. 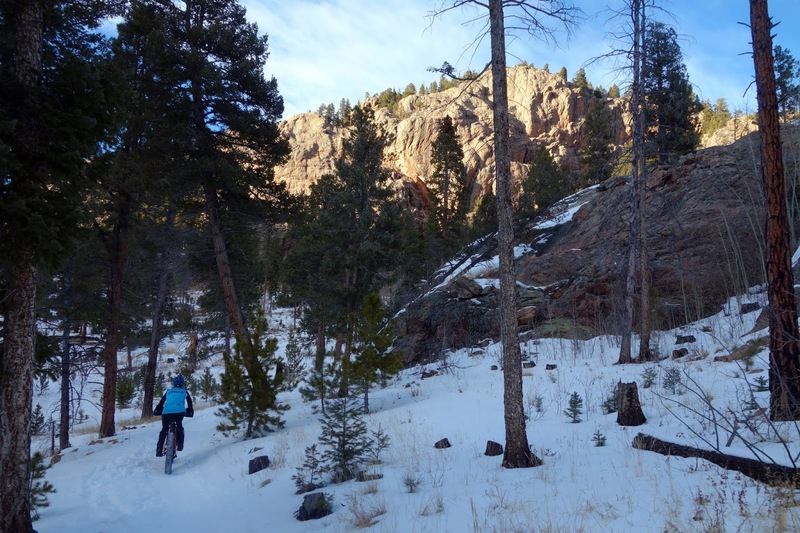 Also, volunteers groom trails specifically for fat biking. Despite receiving several inches of snow on Friday followed by another 40-degree heat wave, the lower trails were in superb condition. It was rather relaxing to just spin on my bike, rather than battle with it. We enjoyed lovely afternoon light with stunning views of the red cliffs that surround the park. We rode into the evening as temperatures plummeted and the day-before-super-blood-wolf-moon rose over the forest. Again, conditions softened considerably as foot traffic lessened, and we played with airing down our tires to almost nothing. Amazingly this allowed me to pedal up a seriously steep trail where my boots punched deep holes when finally forced to walk (My legs did eventually fail in this hard pedaling effort, and we decided to turn around rather than posthole and destroy the trail.) We were both reluctant to air down further. Running my tubeless tires at 1 or 2 psi eventually causes all of the air to leak out, forcing me to stop and pump every so often. I'm sure this issue is solvable, but rather than deal with air-burping at the race in Steamboat Springs next week, I'll probably just return to tubes. I fully expect that all fat biking in Colorado is a 1 or 2 psi affair, eventually. Bouncy, flouncy, fun fun fun. Beat and I got out for our weekly long run on Monday. We define our long runs as anything that takes 7-8 hours of hard effort, whether that just happens to be a 50K or a 12-mile snowshoe slog or, in this case, a 20-mile mountain run. It was a strange day for both weather and trail conditions — starting out so hot and sunny that I was wearing the same type of outfit I'd wear in August. I'd almost believe it was summer, except for the parts where we were skittering over hard ice in the shade of Eldorado Canyon. 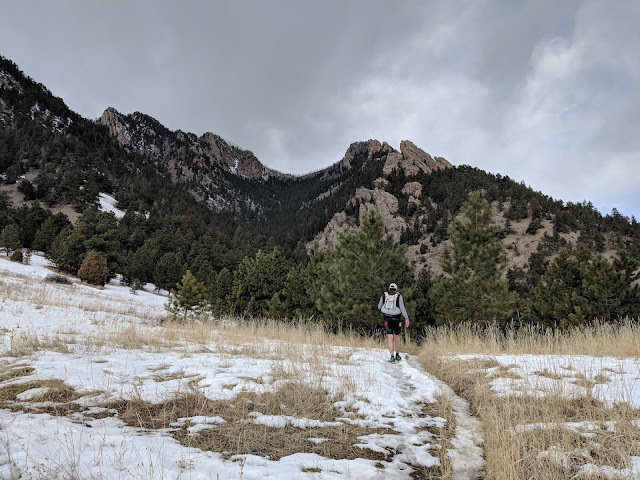 We climbed a mix of packed snow and slush to South Boulder Peak, where the day's forecasted storm moved in with ferocity. 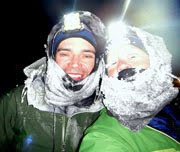 I had to throw on every single layer in my pack, and still shivered while squinting into the frigid wind. For a while it was 35 degrees and spitting snow, and then it was warm and sunny again. The surface conditions were difficult for me, with a strange mixture of mud, slush, ice, and only the occasional relief of packed snow. 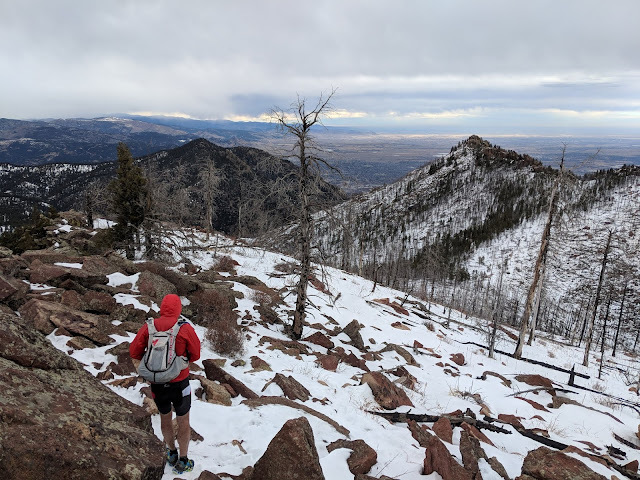 I love a good packed snow trail — once the rocks and roots are covered, this is about as easy as trail running ever becomes around Boulder. But it's short lived, because bulletproof ice and slush-coated slippery rocks are the inevitable follow-up. Seven hours of persistent technical challenges and the required focus is so mentally taxing for me. Between this, the pavement run, and the fat bike rides, this was one of my more solid "mental training" weeks in some time. I even include our holiday trips through the White Mountains in this assessment. While those trips required more physical effort, sled-dragging in Alaska is well within my mental comfort zone compared to this stuff. I confess that I am giddy about returning to California for the 50K on Feb. 9. Now that I've been trail running in Colorado for three years, I wonder whether the steep and muddy trails of the Marin Headlands will still seem as difficult as I remember, or whether I'll be amused by what I used to find challenging. What I'll most likely discover is that I'm still the same timid and awkward runner that I've always been. I think I will forever be a beginning skier. And I had to laugh because my husband is forever begging me to go stomp out trails with my snowshoes so he can ride them. Our "trails" are a lot like yours there. Ha. Every time someone tells me I should try skis instead of fat bikes, I think "but bikes have brakes." We've been trying to come up with a longer packed trail where we can drag sleds for an overnight this weekend, and it's not easy. We'll probably end up on a snowmobile trail closer to Leadville, as most everything close to home where we could camp is just ski and foot trail, probably only packed for 2-3 miles. Thank you! There is a solid women's field this year ... a few fast ladies mixed in with others training for longer endurance events. Should be fun.